As Messianic, Hebrew Roots believers, we take our faith seriously and strive to live according to the commandments and promises of God, as outlined in Scripture – from the Torah through Revelation. At Mercy, our faith is firmly planted on Scripture, from Genesis through Revelation. We have summed up the foundation of our beliefs and core theological positions what we call The Messianic Creed. This core is supported by the totality of Scripture, including the following truths. We believe in the Creator of heaven and earth whose name is Yahweh. "Hear O Israel, Yahweh our God, Yahweh is One" (Deut. 6:4). The Father, Son, and Holy Spirit are united in God (Is. 11:1-2, Lk. 4:18-21). We believe in the Scriptures, both the Old and New Testament in their original, inspired text. They are the inspired and inerrant Word of Yahweh Almighty. They alone are the divine and final authority in determining all doctrinal truths (2 Tim. 3:16). 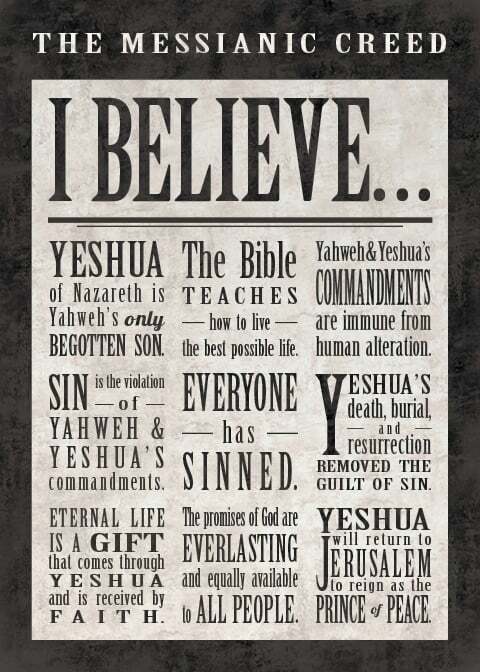 We believe that Yeshua of Nazareth is the Messiah, God made manifest in the flesh (1 Tim. 3:16). He was born of a virgin (Luke 1:34) and lived a sinless life. He died for us an an atoning sacrifice for our sins (1 John 4:10), was resurrected from the dead (1 Cor. 15:4), and has ascended to the right hand of the Father (Mark 16:19). Yeshua will return physically as King of Kings and Lord of Lords to reign over the earth (Zech. 14, Acts 1:9-11, and Rev. 19:11-16). We believe that all have sinned and need the salvation, which is provided only through Yeshua and by the grace of Yahweh (Ps. 14:1-3, Rom. 3-23). We believe that the Holy Spirit dwells in all believers to lead, guide, teach, comfort, and empower us to live a righteous life (Jn. 14:26, 2 Tim. 1:7, 1 Cor. 14:26). We believe in the resurrection of both the saved and unsaved. The redeemed to everlasting joy in the presence of Yahweh, and the lost to eternal separation from Yahweh (John 5: 28-29 and Revelation 20:11-15). We believe the Torah of Yahweh is the instruction of a loving and gracious Father to His children. It is the perfect law that gives us liberty (Ps. 119-44-45, James 2:25-26). The commandments of Yahweh will not disappear until heaven and earth disappear (Matt. 5:17-20). We delight in the instruction of Yahweh (Ps. 1:2). The Torah was not given for salvation. It is the loving instruction of how a redeemed people should live. Yeshua kept His Father's commandments and lived in the Father's love. We are instructed to walk as Yeshua walked (1 John 2:3-6). We are to obey Yahweh's commandments and to hold to the testimony of Yeshua (Rev. 12:17). Family is at the heart of this fellowship. We encourage people to accept all the blessings that Yahweh has given them, children included. We believe that strong families are the building blocks of His Kingdom. We also believe that each family is its own entity and, while part of the congregation, each family is accountable to Yahweh for how they live out their faith. We respect Biblical headship within the home and encourage parents to lead their families and teach their children the commandments of God. Through Messiah's atoning sacrifice, we are part of Israel. We are from the seed of Abraham's faith and heirs of the promises given to him by Yahweh. As followers of Yeshua who have been empowered by His Holy Spirit, we have a deep love for the land, people, and Scriptures of Israel. We believe that worship is a vital part of a Believer's walk. While the expression of worship may vary in each individual, the heart to worship must be the same. Our worship involves music, dance, instruments, study, prayer, and singing. We worship to draw closer to our Creator and give Him all that we have. Worship is between the one who worships and the One who is being worshiped. It is not a show, yet is both personal and corporate. Our desire is to be a body of believers who worship Yahweh in Spirit and in Truth. Mercy Collective is a collection of families and individuals who truly care for one another. We laugh and cry together. We attempt to meet each others' needs in small and large ways. While separated by geography, we are spiritually united.